Camp Buttercup is an intimate English-style glamping retreat located on a private country estate in Southeast Michigan, just 10 miles west of Ann Arbor. Every detail is designed to offer elegance and comfort and a uniquely English tiny home experience made by Blackdown Shepherd Huts in the UK. Bang on trend, and taking the English garden by storm, these shepherd huts create the ultimate glamping experience that is the summer travel trend for 2016 and Camp Buttercup has it all. Buttercup is all about luxury camping and communing with nature with luxurious comfort. 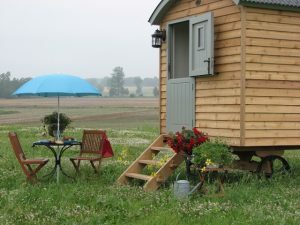 At Buttercup they encourage visitors to experience the mysterious qualities of the humble shepherd hut as it releases you from the noise, clutter and excess of modern-day living while rejuvenating your senses in a lovely and charming setting. The hut sleeps two and is complete with built-in full-size bed, custom wet bar with a hand sculpted English Shaw clay sink, British Perrin & Rowe polished chrome faucet, a spacious under-counter refrigerator, private wash room including shower with well-engineered plumbing fixtures, and lots of storage. Grill outdoors, nap under the sycamore tree, or build a bon fire to await the rise of the lightning bugs beyond dusk. There’s always something relaxing to do. Or do nothing at all. Upon arrival, and the moment you set foot outside your car, you’ll feel a deep sense of serenity. There is a quiet and tranquil energy here that will delight. Slowly wake up to sandhill cranes calling and red-winged blackbirds trilling. Hummingbirds, bunnies, butterflies, deer, turtles, and other wildlife are frequent visitors! Victoria, who owns the retreat, is also a health and wellness coach. As a certified Holistic Health Coach, she counsels and support individuals who desire to make lifestyle changes to experience greater health and well being, as nature intended for us. She uses Camp Buttercup as a place for “re-discovering” the inner body and tapping into the language of health. Buttercup is an English-built hut and is fitted with impressive amenities, yet humble enough to blend into this tranquil setting. Once inside, a wave of cool florals and white linens act as delicate accents in this warm and inviting romantic retreat. With the perfect touch of luxury and convenience, you’ll soon feel calm and quietly alert, and flirtation may subtly arise. You may never want to leave!